dSyntheticMR ABE, (E.P., M.J.B.W. ), Linköping, SwedeneCenter for Medical Image Science and Visualization (M.J.B.W. ), Linköping University, Linkoping, Sweden. RESULTS: No significant difference was found between reference and automatic (and corrected-automatic) ICV (P > .25). The mean difference between the reference and automatic measurement was −4.84 ± 19.57 mL (or 0.31 ± 1.35%). Mean differences between the reference and the corrected-automatic measurements were −0.47 ± 17.95 mL (−0.01 ± 1.24%) and −1.26 ± 17.68 mL (−0.06 ± 1.22%) for Obs1 and Obs2, respectively. The repeatability errors of the automatic and the corrected-automatic method were <1%. The automatic method required 1 minute 11 seconds (SD = 12 seconds) of processing. Adding manual corrections required another 1 minute 32 seconds (SD = 38 seconds). MR imaging–based brain volume quantification is important in several neurologic diseases.1⇓–3 The size of the brain ventricles is enlarged in hydrocephalus, and brain volume is decreased in dementia disorders.4⇓⇓–7 The number, the volume, and the longitudinal evolution of white matter lesions describe the clinical course in multiple sclerosis.8 Commonly, the volumetric measures are normalized in relation to the ICV to decrease the effect of variations in head size.9⇓–11 Manual segmentation of ICV is considered the reference method.12 This is performed by tracing the outer contour of the ICV on each frame in a stack of images covering the head. Unfortunately, this method is laborious, operator-dependent, and time-consuming for a large structure such as the ICV. Therefore, manual segmentation is impractical for clinical routine, and it is important to develop automatic tools to rapidly and accurately assess ICV. Recently, a novel MR imaging quantification sequence, QRAPMASTER, was developed for rapid and simultaneous sampling of the longitudinal relaxation time (T1), the transversal relaxation time (T2), and PD.13,14 Included in this measurement is the correction for the B1 field inhomogeneity. With dedicated software, SyMRI Brain Studio (SyntheticMR, Linköping, Sweden), the QRAPMASTER quantification maps can be processed to automatically segment the ICV, as well as CSF, gray matter, and white matter, a process called “synthetic tissue mapping.” This method is an application of synthetic imaging in which tissue maps are used for brain volume quantification. The purpose of this study was to compare the automatic computation of ICV based on synthetic tissue mapping with a reference. The reproducibility of the automatic method was further investigated by repeating the measurement on different occasions. Nineteen healthy volunteers (mean age, 34 ± 8 years) were included in the comparison. Additionally 6 healthy volunteers (mean age, 32 ± 7 years) were scanned 6 times with the QRAPMASTER sequence. The study was approved by the local ethics committee. Informed consent was obtained from all subjects. All scans were obtained on a 3T Achieva system (Philips Healthcare, Best, the Netherlands). A conventional axial T2-weighted turbo spin-echo sequence was acquired with TR = 3000 ms, TE = 80 ms, 3-mm section thickness, 0.3-mm intersection gap, and 0.5-mm in-plane resolution; 50 sections were collected to cover the ICV. The scanning time was 3 minutes 36 seconds. Assessment by using QRAPMASTER was performed to retrieve the T1 and T2 relaxation and the PD. The sequence was a multi-spin-echo saturation-recovery sequence, with 4 saturation delays and 5 echoes.13 The saturation delays were at 130, 500, 1370, and 2970 ms with a TR = 3090 ms. The TEs were 17.5, 35, 52.5, 70, and 87.5 ms. Each acquisition led to 4 × 5 = 20 images per section with different combinations of saturation delay times and TEs. The in-plane resolution was 1 mm, section thickness was 6 mm, 25 axial sections were collected to cover the ICV without intersection gap, and the scanning time was 5 minutes 28 seconds. The ICV was defined as the volume of the intracranial cavity from the foramen magnum to the vertex. 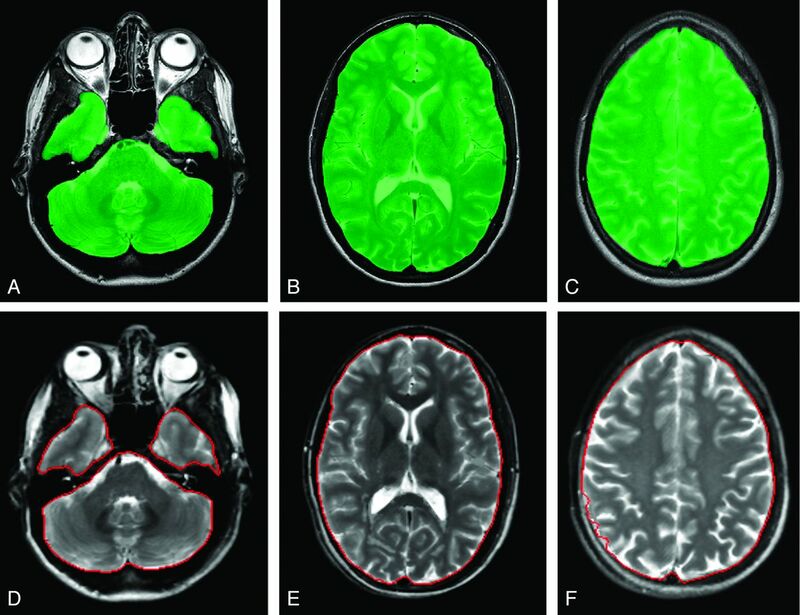 The manual segmentation of the ICV was performed on conventional T2-weighted images by using the image-analysis software QBrain (Version 2.0; Medis Medical Imaging Systems BV, Leiden, the Netherlands).15 The ICV was computed by using a standard computer (2.19 GHz, 1.96 GB of RAM). The ICV border was defined by using a local threshold fixed by an experienced operator (K.A.). In each section, an area was segmented by manually tracing the borders of the region of interest. All manual ICV masks were saved and later reviewed in a session with 2 experienced radiologists (Obs1 = R.B. and Obs2 = T.L.) to ensure segmentation accuracy. ICV masks were corrected until a consensus was reached. The outcome of this procedure was considered the reference ICV. The QRAPMASTER T1, T2, and PD data were analyzed with the SyMRI Brain Studio software, which was integrated in a standard PACS workstation. The software detected T1, T2, and PD combinations characteristic of white matter, gray matter, and CSF, including voxels with mixtures of tissues.16 A region-growing algorithm detected the largest contiguous volume with WM, GM, and CSF and refined the border exactly at PD = 50%, under the assumption that the ICV border corresponds to the interface between CSF (PD = 100%) and bone (PD = 0%). No head-motion-correction technique was used with either the reference method or the automatic method. For the corrected-automatic method, the suggested result of the automatic method was taken and manually corrected by using the SyMRI software. Manual correction was performed by 2 neuroradiologists (Obs1 and Obs2), separately and blinded from each other. To verify the repeatability of the synthetic tissue-mapping method for ICV measurements, we scanned 6 healthy subjects 6 times. Between the scans, the subjects were taken out of the MR imaging system to stand on the floor for a few seconds; thereafter, they were repositioned into the MR imaging system for the next brain scan. 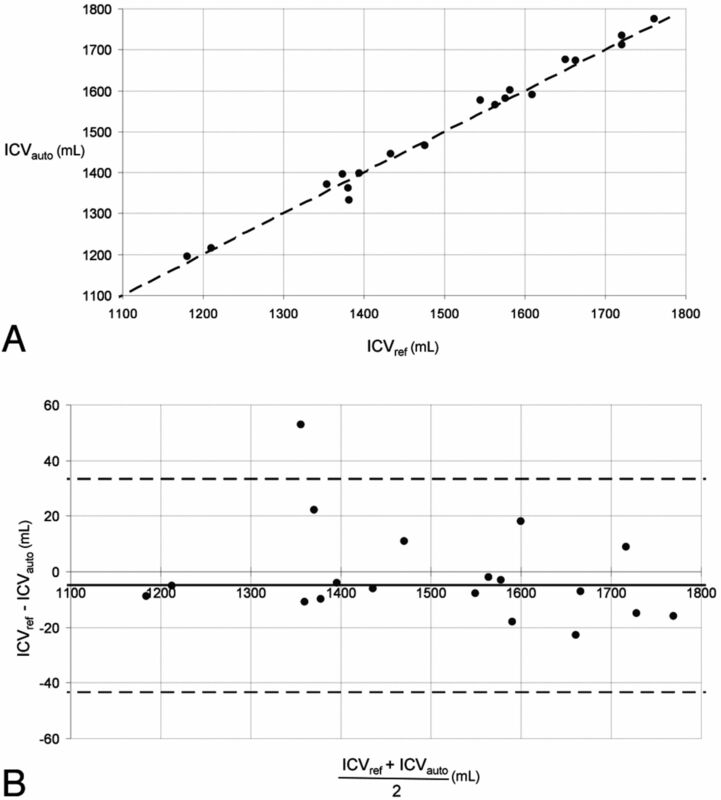 The time taken to perform the quantification of ICV by using the reference, automatic, and corrected-automatic methods was assessed. Regression analysis and Bland-Altman plots were used to assess agreement between methods and operators. The Shapiro-Wilk test was used to test normality. Differences between the means of repeated intracranial volume measurements were analyzed by using the paired t test or the Wilcoxon-Mann-Whitney test when appropriate. To quantify the intrasubject repeatability error (from 6 repetitions) of ICV measurements by using SyMRI software, we calculated the CoV (CoV = SD / mean) for each subject and each method (automatic and corrected-automatic). The group CoV was derived as the average of the intrasubject CoV across all subjects. P values <.05 were considered statistically significant. The statistical analysis was performed with the Statistical Package for the Social Sciences software, Version 12.0 (SPSS, Chicago, Illinois). Intracranial volumes of the 19 subjects assessed by the reference, automatic, and corrected-automatic methods are shown in the Table. Typical sections of reference ICV and automatic ICV method are shown in Fig 1. Typical sections of the reference method (A–C) with the QBrain software and the automatic method with the SyMRI software (D–F). The green area indicates the ICV in QBrain; the red line outlines the ICV in SyMRI. Comparisons between the reference ICV measurements and the automatic/corrected-automatic ICV measurements are shown in Figs 2A and 3A. They were highly correlated (reference versus automatic: R = 0.99, P < .01; reference versus corrected-automatic Obs1: R = 0.99, P < .01; reference versus corrected-automatic Obs2: R = 0.99, P < .01). No significant difference was found between reference and automatic ICV (paired t test, P = .295) or between reference and corrected-automatic ICV (paired t test, P = .910 [Obs1]; P = .759 [Obs2]). A, Automatic-versus-reference segmentation of the ICV in 19 subjects. The oblique black line represents the equality line. The ICV unit is in milliliters. ICVauto indicates automatic intracranial volume; ICVref, reference intracranial volume. B, Bland-Altman plot of the data in A. The horizontal dashed lines are the 95% confidence intervals of the difference between manual and automatic ICV. ICVauto indicates automatic intracranial volume; ICVref, reference intracranial volume. A, Corrected-automatic-versus-reference segmentation of the ICV in 19 subjects. The oblique black line represents the equality line. ICVcor-auto indicates corrected-automatic intracranial volume; ICVref, reference intracranial volume; Cor-auto, corrected-automatic. B, Bland-Altman plot of the data in A. The horizontal dashed lines are the 95% confidence intervals of the difference between manual and automatic ICV. ICVcor-auto indicates corrected-automatic intracranial volume; ICVref, reference intracranial volume; Cor-auto, corrected-automatic. The mean difference between the reference and the automatic measurement was −4.84 ± 19.57 mL, corresponding to a relative percentage error of 0.31 ± 1.35% (Fig 2B). The average difference between the reference and the corrected-automatic measurement was −0.47 ± 17.95 mL or −0.01 ± 1.24% for Obs1 and −1.26 ± 17.68 mL or −0.06 ± 1.22% for Obs2 (Fig 3B). The interoperator variability of the corrected-automatic ICV measurement showed a high reproducibility with an average difference of −0.79 ± 1.27 mL or −0.05 ± 0.08%. The repeatability of ICV measurements for each subject and each repetition is shown in Fig 4. The CoVs of the ICV from the automatic and corrected-automatic method were 0.83 ± 0.14% and 0.77 ± 0.18%, respectively. 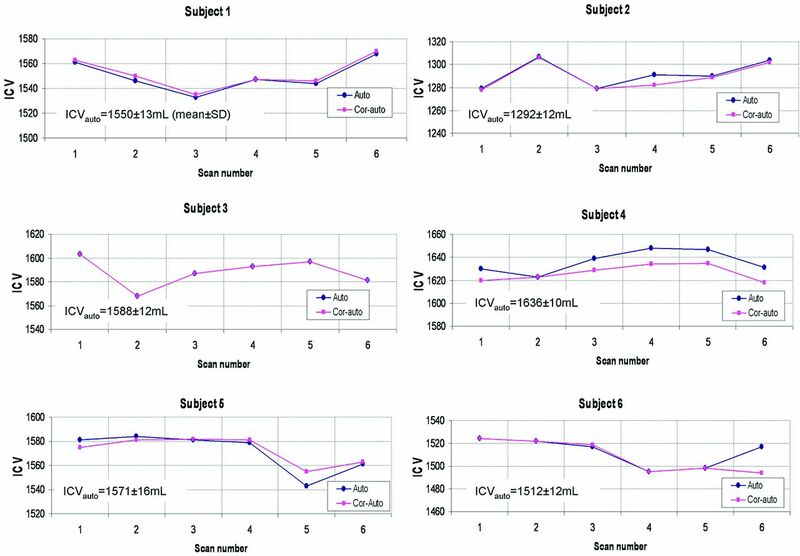 The plots show the automatic and corrected-automatic ICV for each subject and each repetition. Note that in subject 3, the automatic and corrected-automatic ICVs are close. Auto indicates automatic; Cor-auto, corrected-automatic. The mean duration to quantify ICV with the reference method exceeded 30 minutes for all subjects. The automatic method required approximately 1 minute 11 seconds (SD = 12 seconds) to read the dataset and to display the results. The corrected-automatic method time to assess the ICV required an additional 1 minute 32 seconds (SD = 38 seconds) per subject. We evaluated a new quantitative MR imaging method on the basis of a combination of the QRAPMASTER MR imaging sequence and SyMRI software, which together produced an automatic measurement of intracranial volume called “synthetic tissue mapping. ” A high correlation between the reference and both the automatic and the corrected-automatic methods was found. Occasional automatic inclusion of obvious extracranial structures like the orbits motivated manual corrections. The automatic and also the corrected-automatic estimations of ICV with SyMRI software were performed by the evaluator within minutes. Moreover, repeated scans showed the consistency and robustness of ICV measurement by using the automatic or corrected-automatic SyMRI software. A number of other software tools for automatic measurement of ICV are publicly available, such as FreeSurfer and SPM. Although these tools are regularly used, questions remain concerning the accuracy for assessment of ICV. 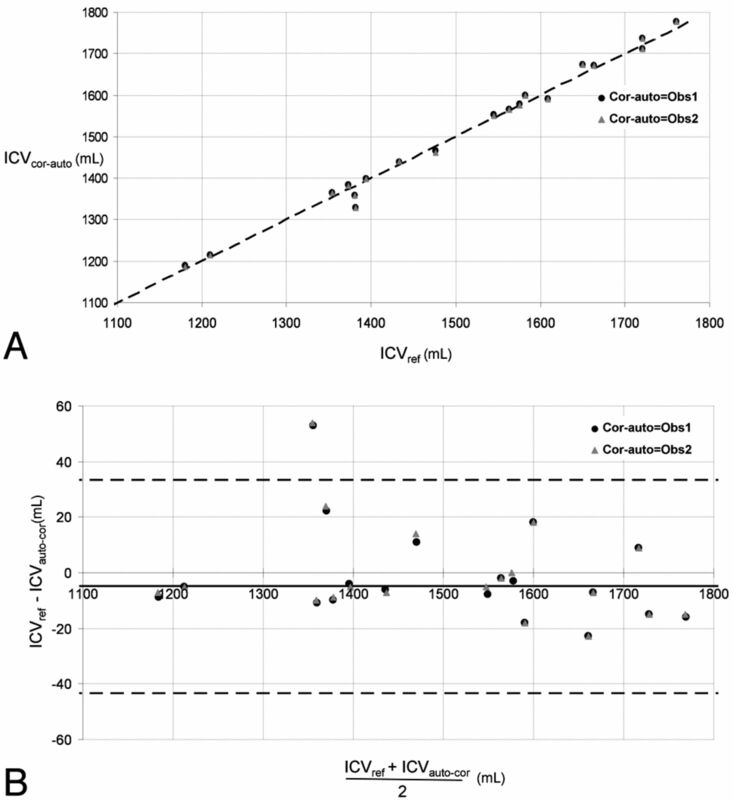 For FreeSurfer software, Lehmann et al17 reported a significant overestimation of ICV (average difference of 133 mL) compared with the manual segmentation. FreeSurfer software is based on gradient-echo T1-weighted images, in which it is difficult to localize the border between the CSF and the skull and the images might be subject to geometric distortion. Furthermore, it uses a scaling factor based on an atlas to quantify ICV,18 which may lead to a dependence on the group characteristics of the subjects that were included in the model. The SyMRI ICV segmentation, on the other hand, is based on spin-echo images, which are less sensitive to geometric distortion, and is model-free. Moreover, the ICV edge does not depend on the image histogram but on the absolute estimation of 50% proton density. Using SPM5 software, a recent study has reported a mean relative error of 3 ± 2.5% and 10.2 ± 1.3% by using 2 different SPM5 settings (from a 3T scanner) between the automatic ICV and the reference method.19 However, when SPM5 was combined with a postprocessing method called N320 (to correct the radio-frequency field inhomogeneities in MR images), the mean relative errors between the automatic ICV and the reference method were of the same magnitude as those found for automatic ICV by using SyMRI software. The authors observed that as a common finding using SPM5 to quantify ICV, a large portion of CSF may be excluded, and this might represent the main source of error. With the SyMRI tool, no such bias was observed for CSF. The misclassifications of the ICV by using the automatic SyMRI were mainly localized in the regions of the eyes, optic nerves, and lower part of the cerebellum. However, the required manual corrections of the automatic ICV mask were easy and fast (< 2 minutes). Despite the excellent agreement between the automatic and reference ICV quantities, we still believe it will be necessary to review and correct the automatic intracranial volume delineation. The partial volume effects are taken into account in the algorithm of the SyMRI software, and lower spatial resolution does not change the estimated ICV.21 The partial volume estimation seems to work well because the acquisition of the QRAPMASTER scan was done with voxels of 1 × 1 × 6 mm, which is a much lower resolution than that of the T2-weighted images of the reference method with voxels of 0.5 × 0.5 × 3 mm. Although the mean difference in this evaluation was close to zero, we still found randomized variations (Figs 2B and 3B). We believe that the main source of the difference was due to the partial volume effects, which, for the manual segmentation, complicate the use of an intensity threshold, especially in the uppermost sections at the vertex of the brain and also at the base of the cerebellum. Another reason might be the slight geometric distortion of the images as a function of patient position. For comparison, a 1500-mL perfect sphere has a radius of 71.0 mm. An apparent inflation of such a sphere with only 1 mm (to a 72.0-mm radius) would lead to an increase of 64 mL of measured volume. The observed SD of 10–20 mL is very small in comparison. Current automatic software tools are not commonly used by clinicians because the computing time and the workflow are considered too long. Pengas et al11 have reported a computing time of several hours for FreeSurfer and 15 minutes for SPM. ICV measurement with the SyMRI software is considerably faster. It takes <3 minutes per subject. Furthermore, the SyMRI tool was directly available from a PACS workstation and, therefore, facilitates the workflow of clinicians to perform the automatic or corrected-automatic quantification of ICV. The repeatability of ICV estimation with the automatic and corrected-automatic methods by using SyMRI software was adequate (CoV < 1%). These results were comparable with the scan-rescan ICV reproducibility with FreeSurfer software. A recent study reported a scan-rescan reproducibility (on 2 separate scanning dates with a 2-week delay) of 1.34% and 2.56% in an older group and a younger group, respectively.10 Pengas et al11 reported that the precision of automatic ICV measurements were better in SPM compared with FreeSurfer when the subjects were scanned twice with an interscan time interval of several months. In a recent study, a fully-automatic commercial software (NeuroQuant; CorTechs, La Jolla, California) was used for volume assessment of several brain structures in dementia.22 This software was evaluated against the manual segmentation, and a good agreement was found between manual and automatic segmentation.23 However, we cannot compare it with our study because the ICV data were not presented. The relatively small sample size and only 3T MR imaging investigations are limitations. Therefore, more research is needed, and it should include patients with tissue abnormalities such as small-vessel ischemic disease and arachnoid cysts and should also investigate the effect of the magnetic field strengths. Furthermore, the next step in the evaluation process of this novel promising contribution to the neuroradiologist tool box would be an evaluation of ventricular volume as well as the brain volume fraction, hence getting a rapid and reliable index of ventriculomegaly and brain atrophy. Automatic and corrected-automatic estimations of ICV with SyMRI software agreed with the reference method. The combination of the QRAPMASTER MR imaging sequence and SyMRI software provides fast and repeatable measures of ICV, and it might help clinicians to rapidly estimate ICV in patients. This work was funded by the Objective 2 Norra Norland-EU Structural Fund, the Swedish Research Council, Vinnova, the Foundation for Strategic Research though their joint initiative Biomedical Engineering for Better Health, and the Västterbotten County Council ALF medal. Disclosures: M.J.B. Warntjes—UNRELATED: Employment: SyntheticMR AB, Comments: employed part-time by SyntheticMR AB, a company providing software solutions for MR imaging quantification and automatic tissue segmentation. Erika Petterson—UNRELATED: Employment: SyntheticMR AB, Comments: employed full-time and took part in the writing within my employment at Synthetic MR AB. Jan Malm—UNRELATED: Patents (planned, pending, or issued): Likvor AB,* Royalties: Likvor AB. *Money paid to the institution. Accepted after revision January 11, 2012.